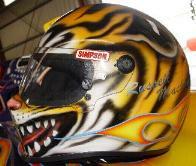 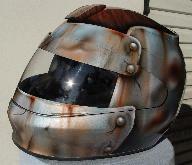 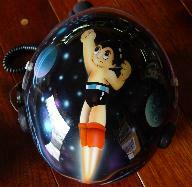 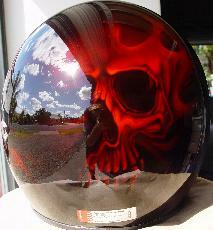 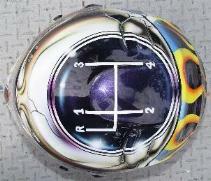 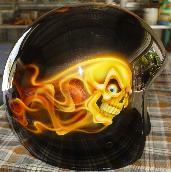 Average price to get a helmet airbrushed is between $600 to $800.00 AU.plus G.S.T. 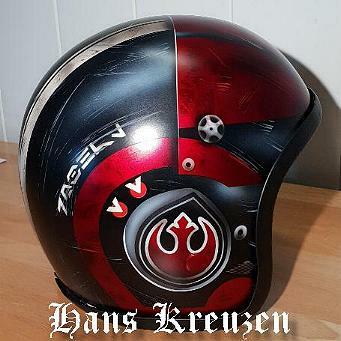 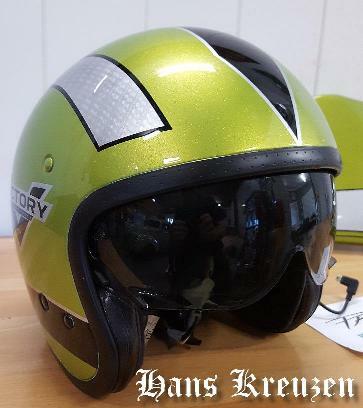 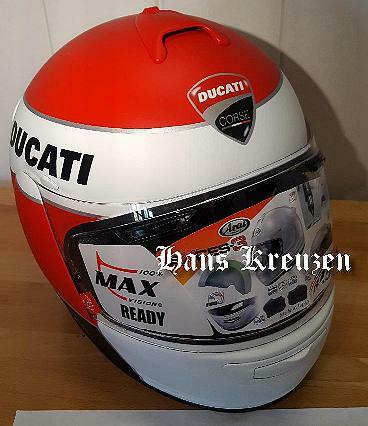 If you are planning to buy a new helmet to get airbrushed, It's best to buy a plane colour helmet with-out the decal grafix, as they are better suited for re-painting. 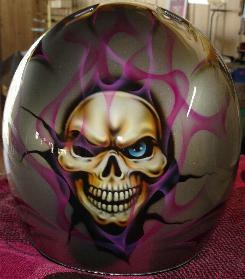 I prefer not to paint over a flat black finished helmet. 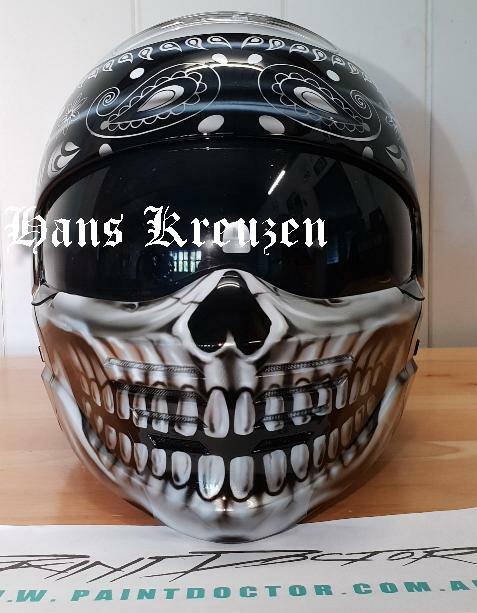 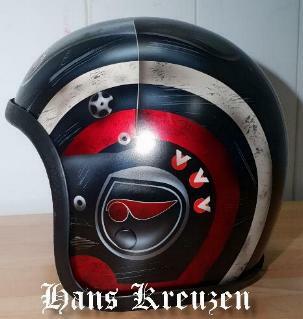 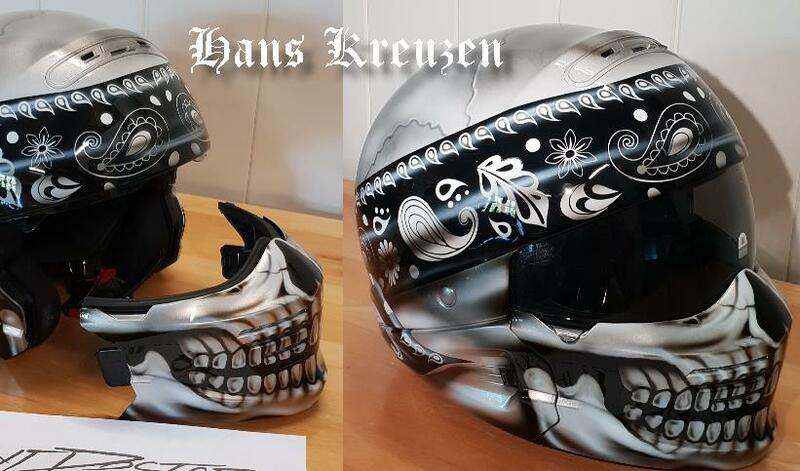 Harley Davidson two piece helmet with a airbrushed skull wearing a bandanna. 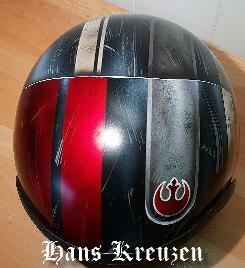 "Click the logo to visit our Facebook page and Like or Follow Us"
Luke Sky-Walker "Star Wars" helmet, finished in a semi gloss clear coat. 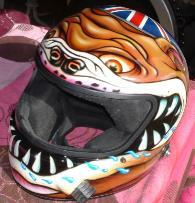 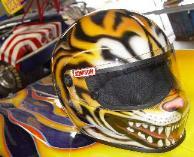 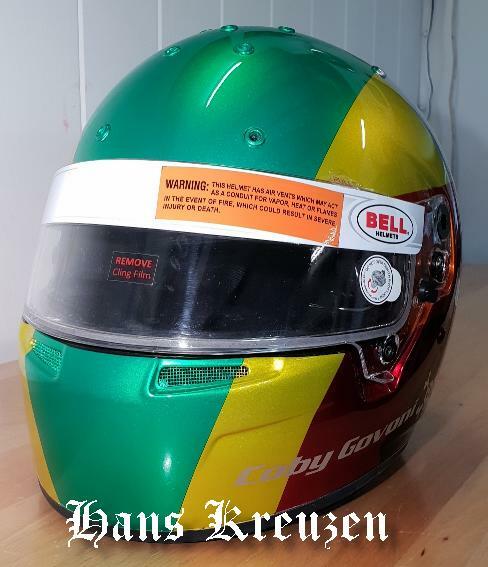 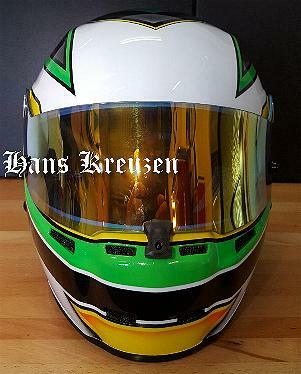 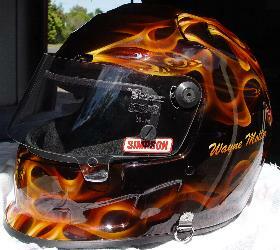 Bell racing helmet used for Kart Racing. 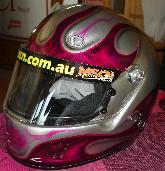 Painted in candy apple colours over a silver base. 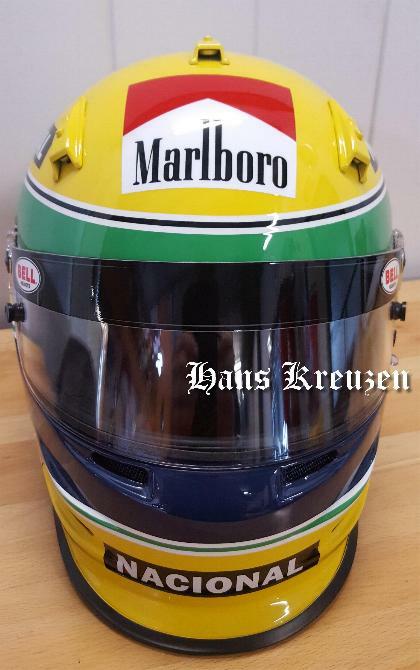 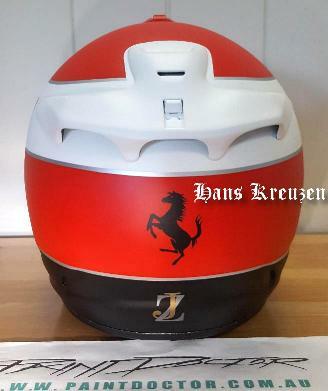 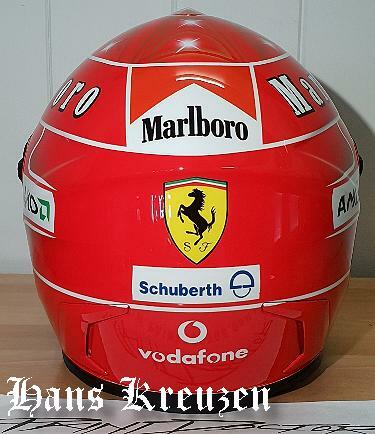 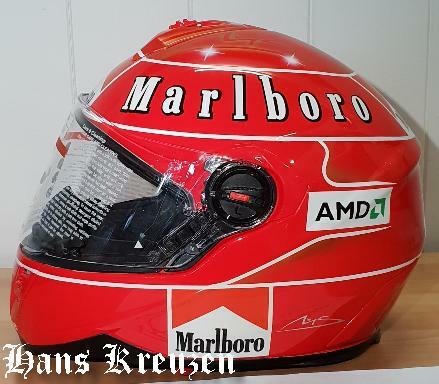 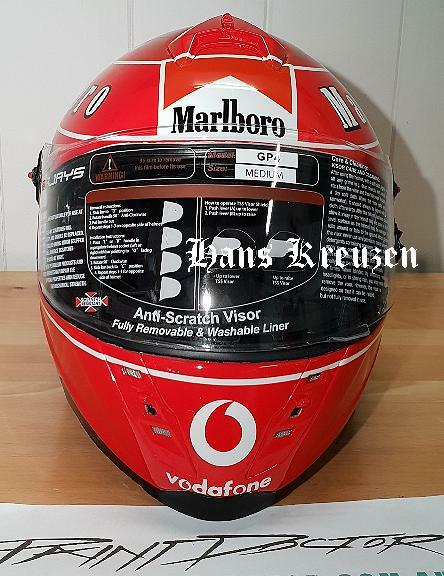 Schumacher replica helmet used for Kart Racing. 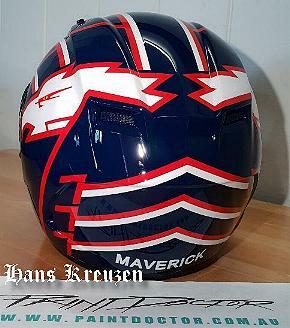 Maverick helmet replica from the movie "Top Gun" all striping and writing is painted on and clear coated. 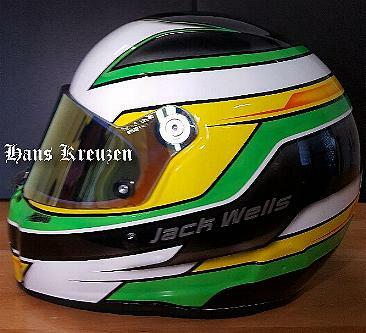 Racing Go Kart Helmet for Jack Wells, all striping and writing is painted on and clear coated. 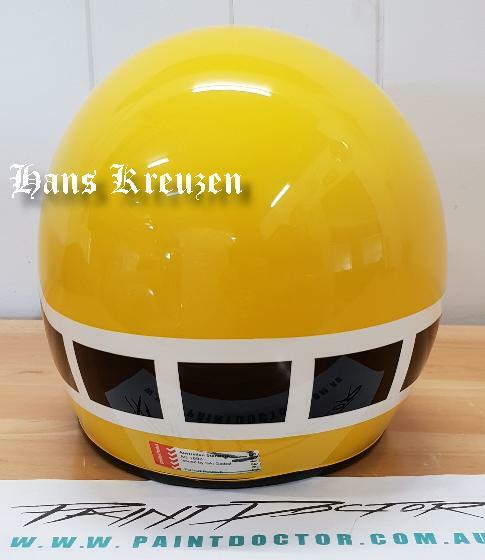 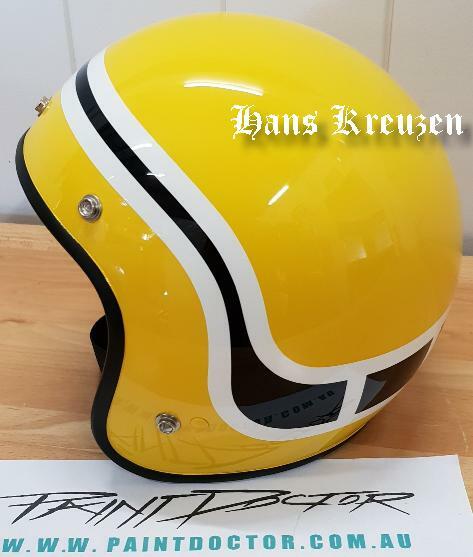 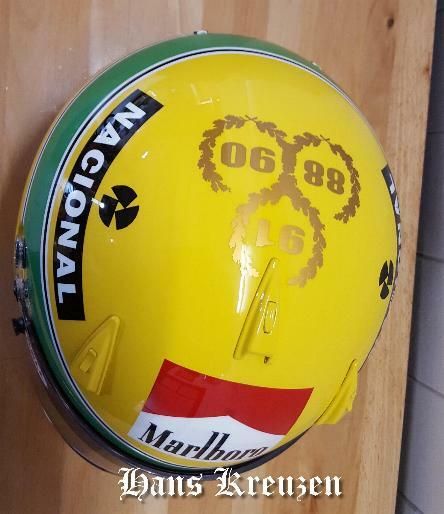 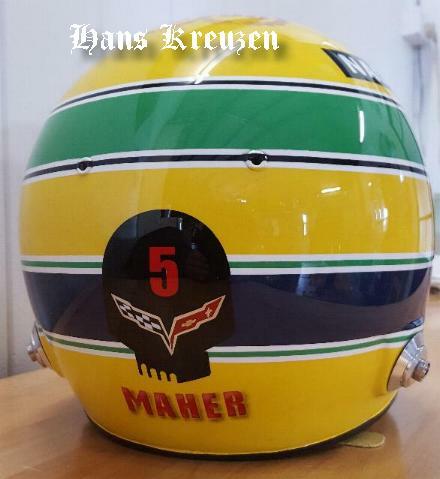 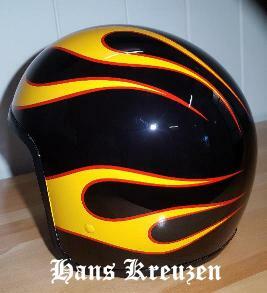 This helmet was colour matched to the 1970's Yamaha Yellow, the striping is painted on with clear coat over-lay. 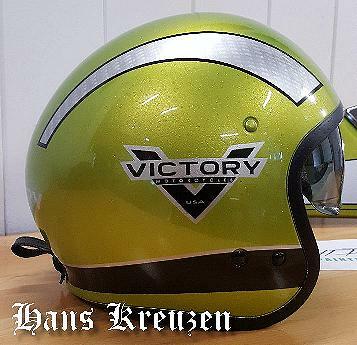 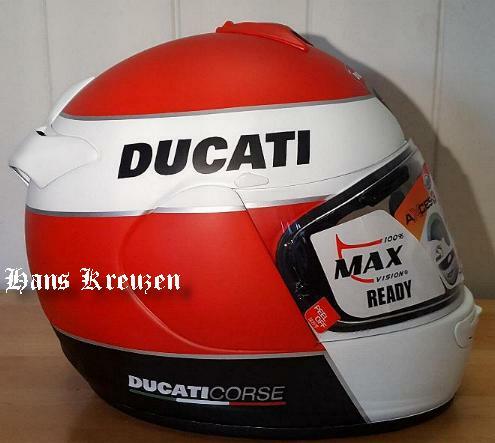 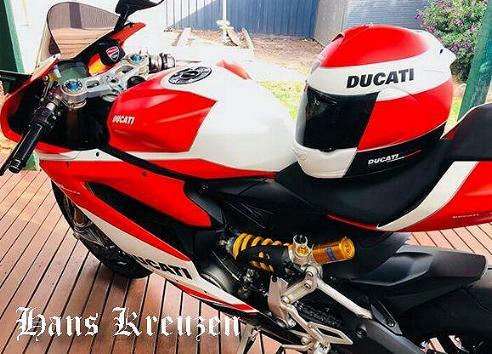 This helmet was colour matched to match the owners Ducati motorcycle and finished in flat clear coat. 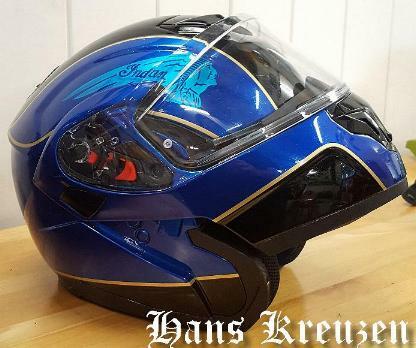 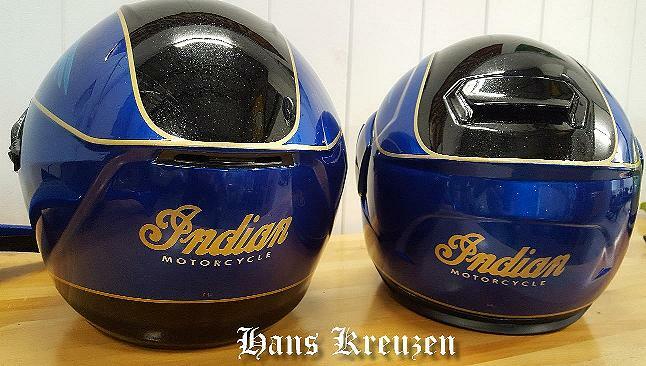 These helmets are colour matched painted to match the owners Indian blue metal-flake motorcycle. 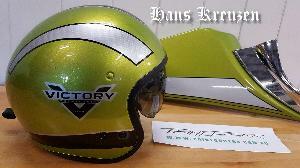 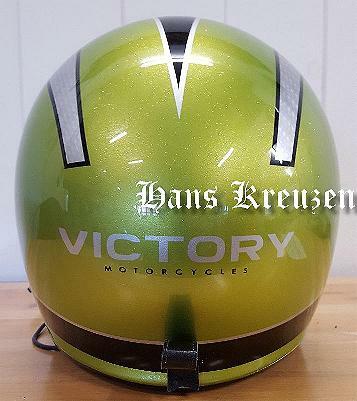 This helmet was colour matched painted to match the owners Victory motorcycle. 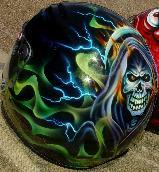 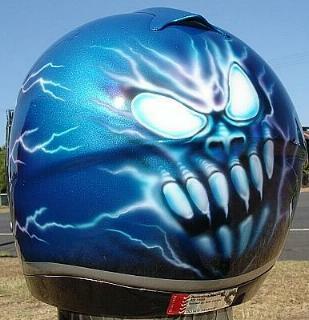 Bell Rogue helmet with the airbrushed "Joker" face. 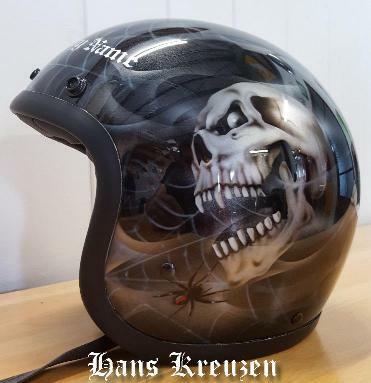 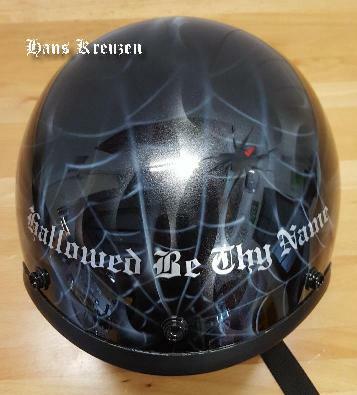 Open face helmet with "Hallowed be thy name" red back spiders and skulls. 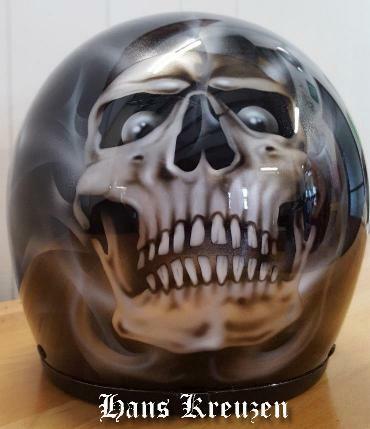 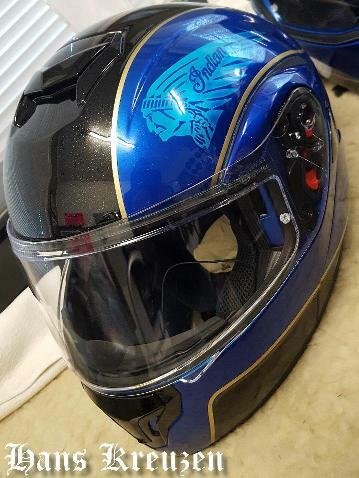 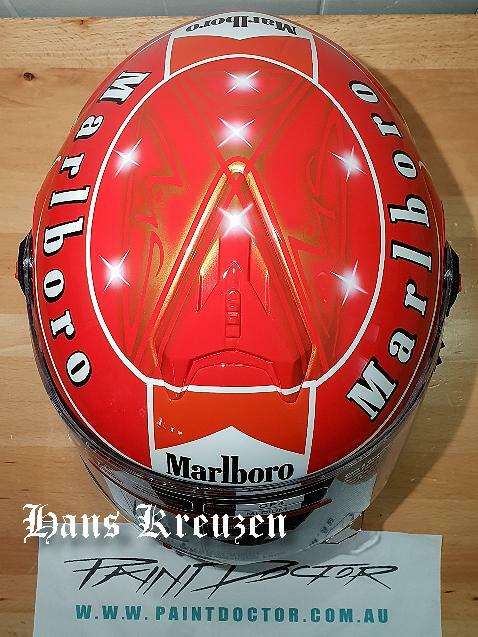 "This helmet was sent all the way from SPAIN (Europe) for me to airbrush." 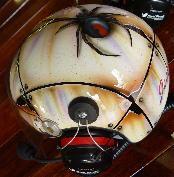 Bell Rogue helmet and face mask, Airbrushed in half mechanical and half human. 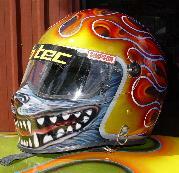 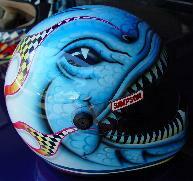 Helmet airbrushed with a Dragon theme. 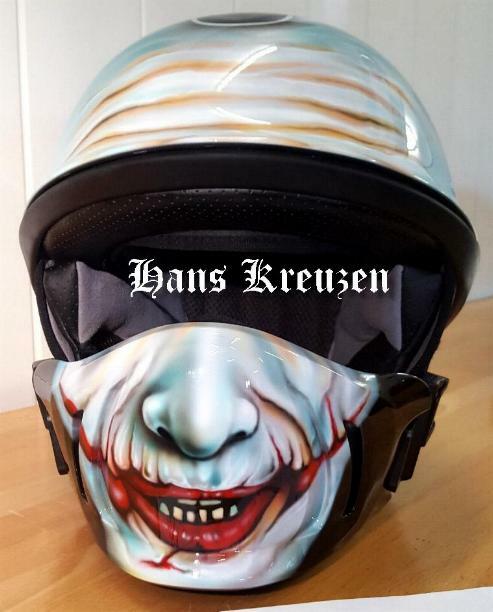 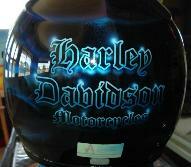 Helmet painted to match owners Harley with airbrushed club logo's. 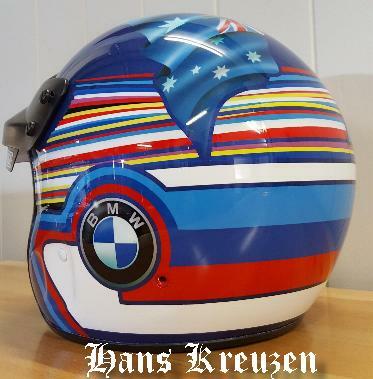 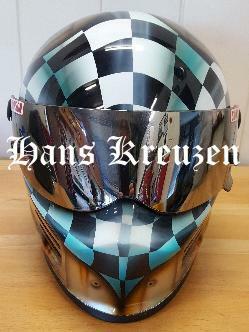 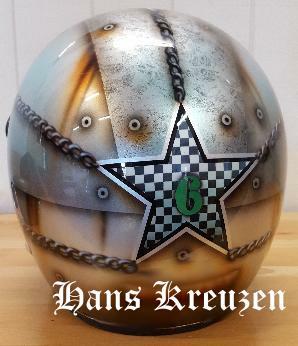 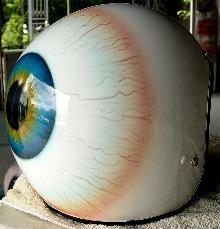 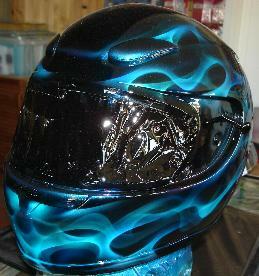 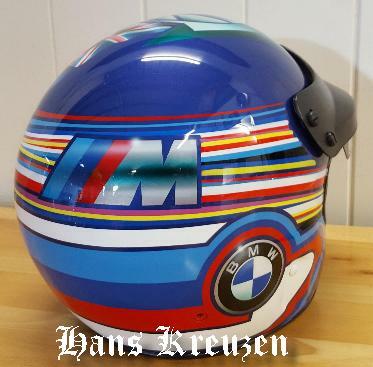 Kart racing helmet airbrushed with early retro Grand Prix theme and finished with matt finish clear coat overlay. 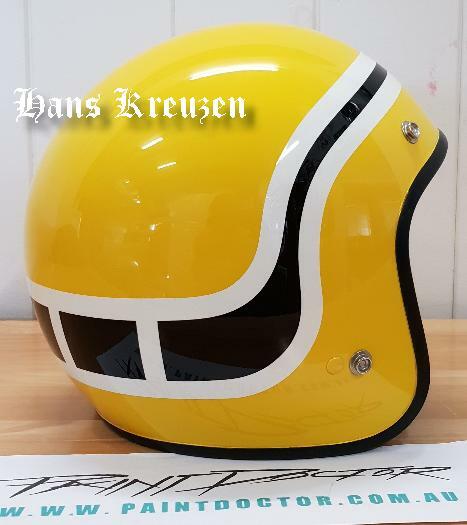 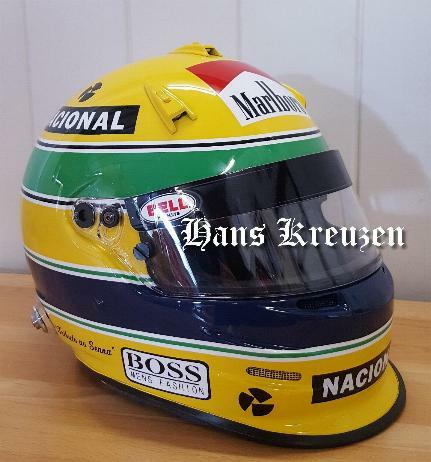 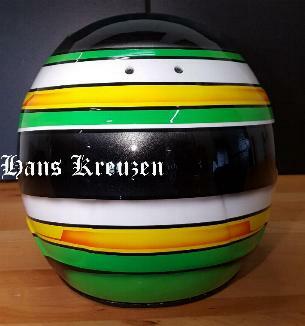 Kart racing helmet early F1 Sena replica. 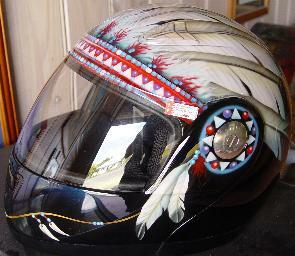 Open face helmet airbrushed with a Native American chief and eagle theme. 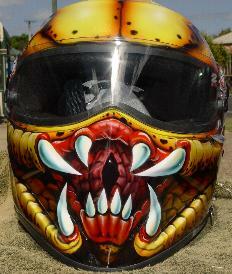 Open face and peanut helmets with "Terminator" airbrushing. 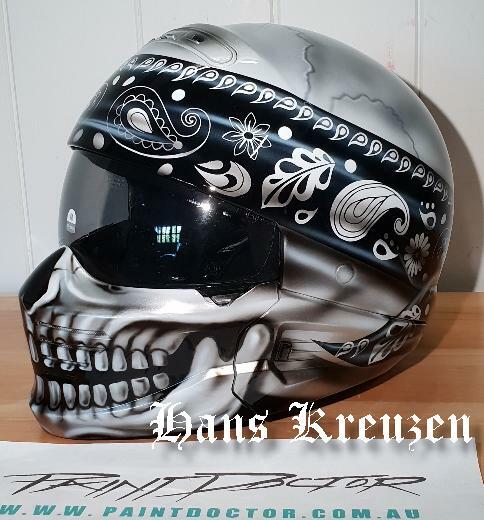 Open face helmet with "Iron Maiden" art and "Breakout" sign. 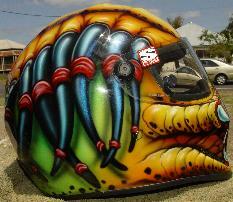 Flip up Harley Davidson helmets, painted to match the owners bike. 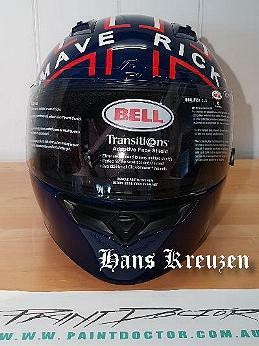 Legal for road use German helmets. 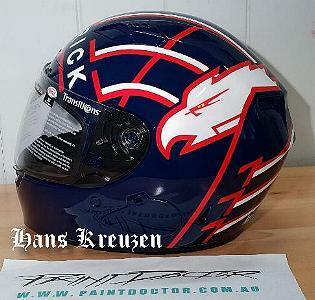 "KFC" airbrushed "Hot and Spicy" artwork on helmet and visor. 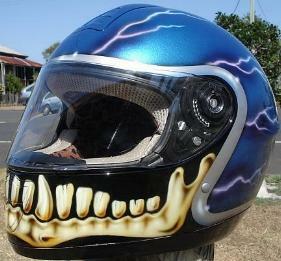 "Iron Man" airbrushed artwork on helmet and visor, Helmet is from Perth W.A. 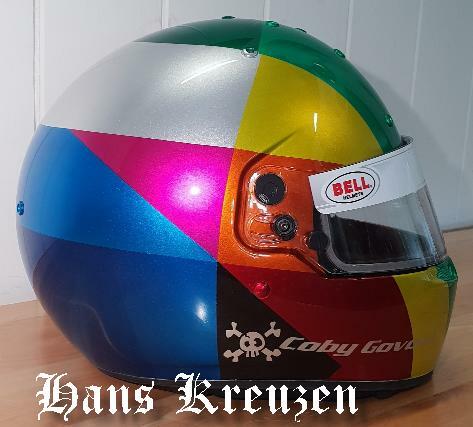 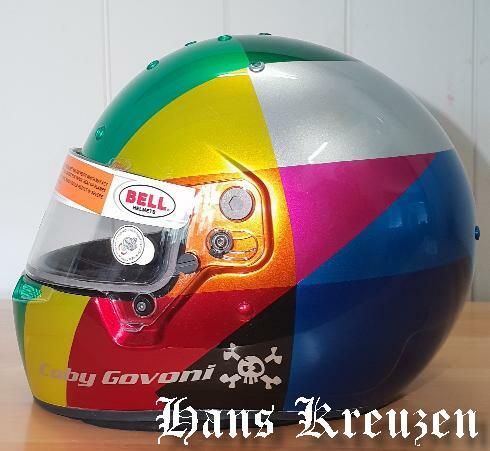 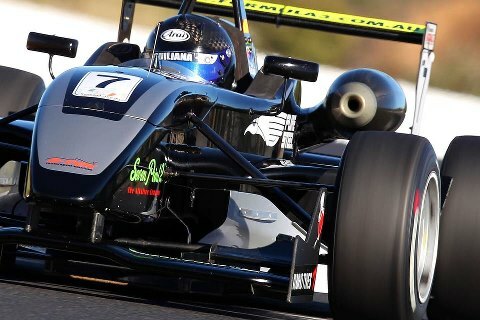 "Click on Image for Direct Link"
Steel Guiliana's Carbon Fibre helmet, when he drives his Formula 3 "Pure Steel" racing vehicle. 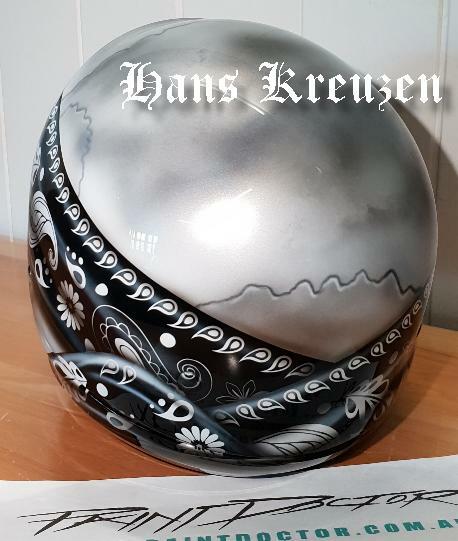 Harley helmet with "Fate of the Nation" airbrushed artwork. 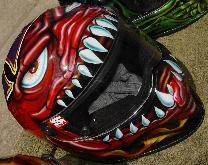 Shark (Slit, Flip-Up) helmet in Candy Red, Black with realistic flames. 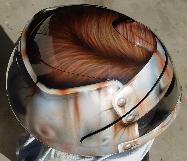 Skull helmet in realistic bone colours. 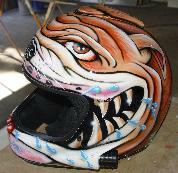 Art on open face helmet's. 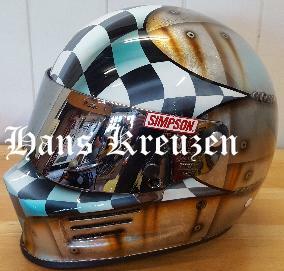 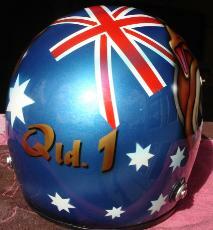 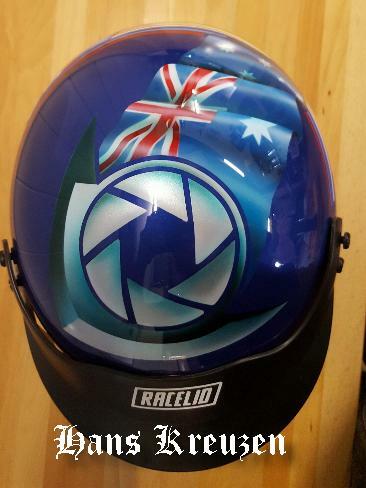 Ned Kelly themed racing helmet. 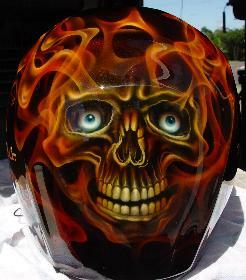 Scull with realistic flames on racing helmet. 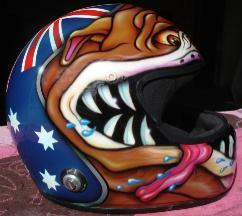 Dog wearing old school helmet. 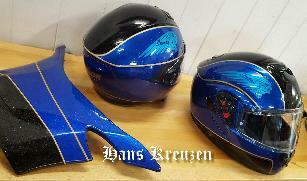 Zachary Peirano Helmet, Lexus Piranha HOT ROD "Modified Eliminator"
Nathan Peirano Helmet, Lexus Piranha HOT ROD "Supercharged Outlaws"